Firelake Grill Shut Down in Tenleytown | Tenleytown, D.C.
Posted on July 8, 2014 by Tenleytown, D.C.
Another restaurant has come and gone in Tenleytown. 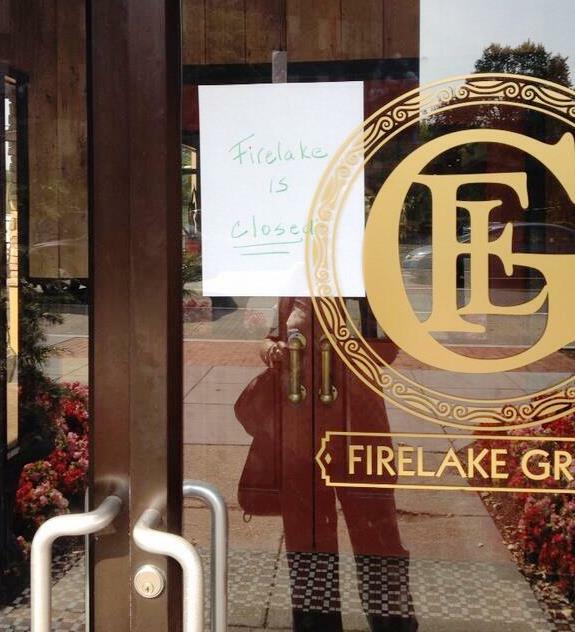 A hand-written sign posted on the door of the Firelake Grill today read “Firelake is Closed.” And while we were reaching out for confirmation of the closure, US Marshals showed up at the restaurant. No word yet on what precipitated the eviction, though there had been – unconfirmed – rumors of financial troubles. A call to the restaurant earlier today went unanswered, as did an inquiry through its Facebook page, which has not been updated since April. Firelake Grill’s website – as well as that of its parent group Fired Up Grills – is no longer available. A notice from web host and domain registrar GoDaddy indicates that the domain names expired at the start of July. Sadly, we’re not surprised to learn that Firelake Grill has closed. Business never really picked up, despite a menu reboot earlier this year, and the restaurant rarely had a full house. While the bar had potential, the quality of the food was sorely lacking (you can read our review from February here). Firelake Grill joins EurAsian in having the dubious distinction of closing up shop in under a year. The “upper casual” restaurant opened in the fall of 2013. Our thanks go out to Nadia Pflaum (on Twitter at @NadiaPflaum) for the tip.